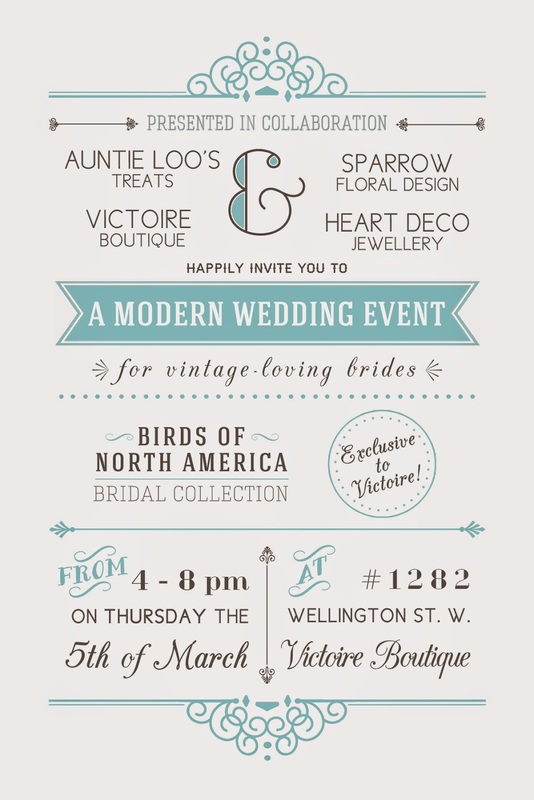 On Thursday March 5th, Victoire Boutique will be welcoming local cake legend Auntie Loo, estate ring maven Heart Deco, and the magical Sparrow Floral Design, while unveiling the bridal collection of Montreal-based Birds of North America. A night not to be missed for all those seeking a wedding day filled with beauty, charm and individuality. In anticipation of the 2015 wedding season, the celebration will be held from 4pm to 8pm at Victoire’s 1282 Wellington St. West shop. Grace Irving, owner of Heart Deco, will be in store to meet party-goers and answer questions about her selection of vintage and antique wedding and engagement rings. Auntie Loo's Amanda Lunan will provide cake samples, and an opportunity to discuss your fantasy wedding cake. Vanessa Madely of Sparrow Floral Design will be showcasing and selling beautiful floral arrangements, and booking consultations for the upcoming wedding season. Victoire will be selling the 60's-inspired bridal collection of very affordable and eye catching design from Birds of North America. Too many brides find the mainstream "Bridal Industry" to be rigid, or exclusionary towards those who want a wedding day that reflects their own ethics, aesthetics and most importantly budget. This event has been designed to bring together four businesses that cater to the woman looking for extra romance, flare and those personal touches that make her day truly her own. You turn to your favourite local businesses for special occasions through out your year, why not include them in your wedding day too?! For more information, visit Auntie Loo's website at auntieloostreats.ca or Victoire at victoireboutique.com. Sparrow Floral Design can be found at sparrowfloraldesign.ca and Heart Deco can be found at heartdecovintage.com.